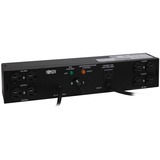 The ECO9000UPSM standby green UPSoffers complete protection from blackouts, brownouts and transient surges.Supports green energy savings via built-in Eco outlets that automatically poweroff unused computer accessories like printers or multi-media speakers when thecomputer is not in use. Full load efficiency rating of 99% also offersenergy-savings and cooler operation by limiting UPS power consumption to lessthan 5 watts! Eco-friendly design meets strict RoHS environmental standards.Provides uninterrupted transition to battery-derived AC output during brownoutsand power failures with enough runtime to save and shutdown connected equipmentwithout data loss. Offers complete protection in an ultra-compact desktop orwall-mountable housing. Includes 6 battery supported outlets for computer,monitor and four vital system peripherals, plus 6 additional surgesuppression-only outlets for accessories not requiring battery support. 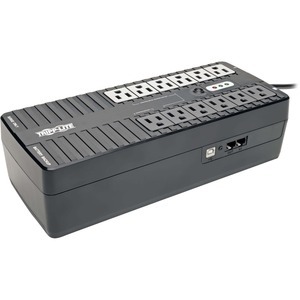 Four ofthe surge-only outlets are designated Eco outlets that can be configured toautomatically power-off when the computer enters standby mode or is shutdown.USB port enables UPS configuration options and unattended system shutdownwithout data loss in the case of extended power failure. PowerAlert software isavailable via free download from www.tripplite.com. USB cable included.Built-in single line RJ11 phone suppression protects modem, fax machine,cordless phone or other accessories with a dialup/DSL phone connection.Built-in audible alarm and front panel LEDs offer continuous status informationregarding line and battery power operation. 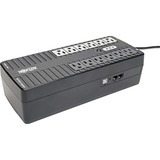 900VA/480 watt power handlingability supports entry-level PC systems for up to 45 minutes during power failconditions. $100,000 connected equipment insurance (USA, Puerto Rico, &Canada Only).